Wooden structures can be functional, making landscape maintenance easier or increasing living space. Everyone thinks immediately of decks, which you can even build yourself, but some less obvious examples are offered below. The storage shed is the poster child for facilitating maintenance work, providing easy access to tools and lawnmowers. But wooden structures can be decorative, as well as functional, especially in the case of gazebos and garden arbors. Garden arbors are often used for trellising. For instance, there are the structures traditionally used to hold up grapevines. But vine-covered wooden structures can also be planted with ornamental vines (such as Dutchman's pipe) and serve as privacy screens. 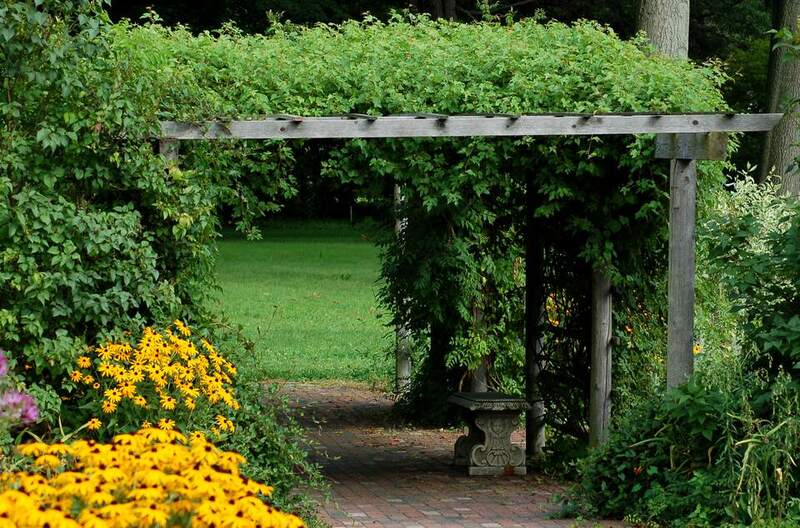 Another function of such a vine-covered arbor is to provide shade, including on decks and patios. Arbors can also function simply as decorations. Sometimes they form gate entries. There is a related wooden structure termed a "pergola." You can think of the latter as a bigger, more elaborate version of an arbor. The concept behind the two, however, is similar, and it may be difficult to draw the fine line between a large arbor and a small pergola. Both commonly support vine plants. Pergolas are, though, more likely to be built up against a house. In fact, a covered pergola jutting out from a house wall serves as an extension of the house, allowing you to enjoy an ​outdoor living space. You can take meals al fresco under such a structure, for example. Would you enjoy your yard more if you had a covered wooden structure out there in which to take your meals or munch on a snack? Sort of an outdoor room? Enter the gazebo. Depending on the style you select, these wooden structures can also add to the beauty of your lawn and garden decor. Gazebos are similar to that classic structure that is so evocative of a bygone era, in which the pace of life was slower, and "stress" was something that tree branches felt—not people. A gazebo is essentially just a smaller version of a bandstand. Another difference is that a gazebo is used for private, not public purposes. Bandstands usually occur in public parks; they are wooden structures where a band can stand to play their music. But if you wish to call your gazebo a "Bandstand," to evoke an image that will relax your mind and sweep away the stress of the modern world, your secret will be safe with us. Do You Want Vinyl or Wooden Structures for Storage? Do you need more storage space, but you don't want a big wooden structure plunked down in the middle of the yard? Not to worry, this resource offers sheds for those with light to moderate storage needs. Some of these sheds add a touch of style to your landscaping, as well. When talking about storage units for the yard, the issue of materials often comes up. What's better, a wooden shed or a vinyl shed? This article on outdoor storage buildings discusses both. If you want low-maintenance, vinyl is probably your best bet, since you won't have to stain or paint it. There are numerous choices nowadays for vinyl (different colors, etc. ).